It’s difficult to escape the suspicion that Krakow’s newest bridge was built primarily to make getting to Drukarnia easier. I insist on calling it ‘the footbridge’ on the grounds that the official moniker, ‘Kładka Ojca Bernatka,’ is too much of a mouthful even when sober. Poland has not learned its lesson when it comes to naming chunks of public engineering. The bridge that stood on this location until 1925 was officially called the Emperor Francis Joseph I Bridge, but everybody called it the Podgórski Bridge on the eminently sensible basis that it was the way to Podgórze. Warsaw’s newest bridge has been officially dubbed ‘Most Marii Skłodowskiej-Curie’ even though Varsovians have been calling it ‘Most Połnocny’ (Northern Bridge) since the first plans went on display, and will continue to do so until everybody suddenly has a lot more time for enunciating things. The hope was always that the Love Bridge (I’m just going to call it different things until one of them catches on) would result in a flourishing of places in which it would be possible to hang out between handsome Krakow proper and gawky, adolescent Podgórze on the other side of the river. Words such as ‘up-and-coming’ and ‘burgeoning’ have been thrown around recklessly with respect to Podgórze. We were there on a Friday evening in prime imbibing hours and the place was as dead as a cliché about dodos. Tumbleweeds may have featured, if they hadn’t been outlawed as overly stimulating by the local burghers. 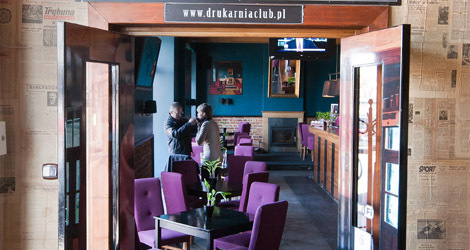 Officially known as Drukarnia Jazz Club, and universally referred to as Drukarnia, this outpost of Krakow-style hanging out in the former Austro-Hungary is one of the city’s top pub experiences. 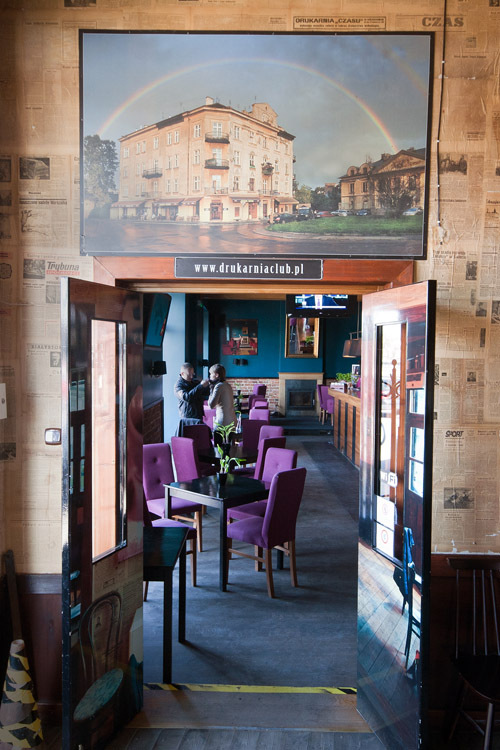 It’s not hard to see why the money was spent on providing an outrageously gorgeous bridgehead to relieve this outpost in the wilds of southern Małopolska. On a side note: ul. Mostowa, the approach to the Orphan Bridge (I’m becoming more creative), has the distinction of hosting BOTM’s first al-fresco beer of 2012. Commando scouts for the group downed a couple at a pavement table outside Mostowa ArtCafe on Friday, March 23. Beat that. I will be living in your neighborhood from July 20 – Aug 22nd. contact me here. I also have a FLAMENCO GUITARIST that lives in Krakow.